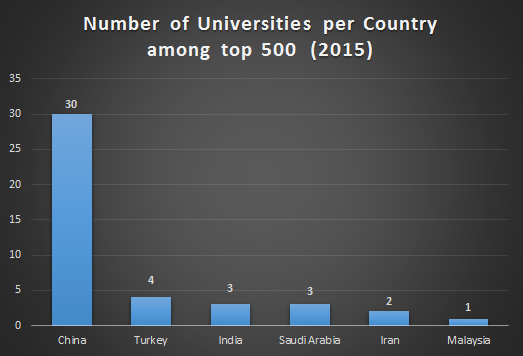 According to the latest Global Universities ranking (2015) announced by U.S. News & World Report, a leading US based publisher of Education analysis and rankings with 30 years’ experience, none of the Pakistani University could make a place among top 500 best Global Universities, compared to 30 Universities from China, 4 from Turkey and 2 from Iran. This is an unfortunate sign for a country that had a budding population of young people, but clearly a dearth of quality Institutions, to churn out skilled minds. 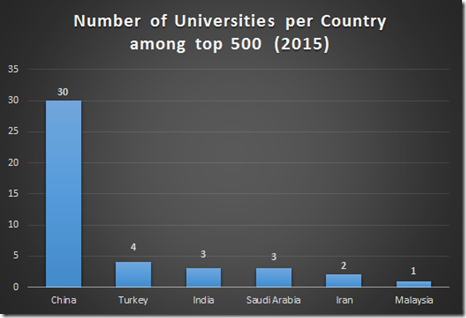 Even Pakistan’s arch-rival India, which has the same troubles and woes as Pakistan, has 3 Universities in the top 500. The Higher Education Commission (HEC) of Pakistan is playing an active role in improving the quality and trying to overcome the problems. Despite being established in 2002, HEC has managed to draw attention of Higher authorities towards betterment of Higher Education in Pakistan. Still, It will be too soon to compare the progress with any other Educational Organization around the world, but here is the numerical data for analysis. Pakistan is spending 2.68% of GDP on Education, that is awfully low as compared to other developed nations. The Higher Educational institute faces financial problems which lead the technological constraints in term of lack of laboratories and libraries that adverse effect on teaching and quality of Education. An enormous and unmanageable gap exists between the resources and the expenses of the Universities. Universities lessen this gap by increasing the number of students, which affect the efficiency of the institute. Presently, against the requirement of 7000 faculty members in Pakistan public sector Universities only 1700 have PhD degrees. It is estimated that only about 27% (average) of the current faculty members hold PhD degrees, whereas doctorate degree is widely considered as an essential prerequisite for imparting quality Education. Many faculty members in most Universities are just bachelor or master degree holders with little or no practical knowledge and Higher Education experiences. The financial rewards and benefits for the faculty are very low, considering the cost of living in Pakistan. Research does not only play a vital role in economic and social development of society, it is also critical to any University. Universities are a research institute and it is the responsibility of the University to generate and disseminate the knowledge, but as identified that due to unavailability of the professional faculty the usage of research facilities are dubious in Universities of Pakistan. Moreover, in Pakistan, research is conducted, but number of publications are comparatively low. Another affected area is research reputation. It is observed that the trend of plagiarism is on the rise due to lack of interest or resources. Decades of under-investment in the Higher Education System have left the physical infrastructure of Universities unable to meet the demands of an ever increasing demographic. Strategies for increasing enrollment in Higher Education, improving research capacity and improving quality of Education programs require that the infrastructure exist to ensure the success of intervention strategies. Though research observes an improved state of infrastructure of Higher Education institutions due to HEC efforts. Thanks to HEC curriculum revision team that has brought syllabuses of various programs in line with today market demands/ trends. Otherwise few years back HEI curriculum were so outdated that most of the departments were teaching 20 to 30 years old course contents. However, there is still dire need that 100% curriculum shall be developed in line with national and international needs. The Educational crises in Pakistan is the outcome of increased level of conflicts, this is because of politicization within the institute and no attention is paid to resolve it and the results comes in form of indiscipline, lower Educational standard, violence and lockouts. Professional deficiencies exist in the field of teaching due to the high political influence in the Educational Institutes. Another destructive element for the quality of Education is corruption that has deprived Pakistan in all sectors. As argued that corruption occurs at all level and intake several stakeholders including faculty, students, examination body and other official employees. Corruption, illegal promotion, excessive foreign tours, heavy salaries, unnecessary utility bills and lack of accountability are undesirable issues of Pakistani Universities. Luckily over the last few years, HEC put forward a policy to improve Higher Education System but due to major political influence, expected results are not yet attained. Higher Education policy note (2006) disclose that the Management and Governance of the Higher Educational Institutes hampering the quality of Education because of ignoring the federal University ordinance and appointment of voice chancellors on the bases of political influences by ignoring the criteria and merit based selection. Over six decades of consistent failure in creating a viable Higher Education System. It is more important than ever to invest more in Education and then adopt the accountability system to ensure its effectiveness.